Well, it’s officially nearing the end of the summer, and that means that it’s our last chance to make use of some seasonal produce before… well, let’s not kid ourselves – pretty much everything from the summer is still available all winter round, albeit at a price. But my late summer favourites are strawberries, tomatoes and corn on the cob, and it’s now that these babies come into their own. All of these are on sale at supermarkets, but if you get yourself to a farmers’ market, you can get them even cheaper. Punnets of strawberries for a couple of quid, tubs of cherry tomatoes for 70p, I even bought five ears of corn for a pound a couple of weeks ago. 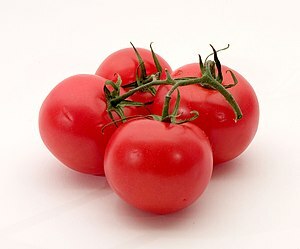 Here’s a great recipe I found in a foodie magazine ages back, for a crispy crouton and spicy tomato salad. Although it’s called Panzanella in my recipe folder, panzanella is usually made with bread that’s a bit soggier than the stuff you’ll find here. This recipe gives you fresh tomatoes, peppers and cucumbers, drizzled with a spicy, garlicy dressing, and pepped up with crunchy, crispy croutons. It’s one of my favourites, and you can make it all year round thanks to the supermarkets. But why not make it now, when everything’s at its cheapest and best? Turn the oven onto medium heat and drizzle some of the olive oil over your bread chunks. Sprinkle with a little sea salt and bake in the oven until crunchy and golden brown. Cut your salad ingredients (pepper, cucumber, tomato, onion). Crush the garlic and chilli together in a pestle and mortar with some sea salt until you get a pungent paste. Mix the vinegar, sugar and olive oil together, and whisk in your chili, garlic and sea salt. Mix together the dressing with the vegetables, and allow them to sit for around an hour. Wait until just before serving to pour the veggies and sauce over your croutons, to keep them crispy and fresh. Tear over the basil leaves and serve. Kate and William: planning your wedding watch!